Dr. Tran grew up in Alhambra, CA. She graduated from the University of California Irvine with a major in Biology and minor in Art History. Dr. Tran received her degree from the Illinois College of Optometry in Chicago, IL and is residency trained in Low Vision Rehabilitation from the SUNY College of Optometry and Lighthouse International in New York, NY. She has had the opportunity to travel to many cities and states in which she completed externships and has worked in several different modalities of practice such as private practices, academics, and VA hospitals. Dr. Tran is active in the American Optometric Association, a Fellow of the American Academy of Optometry and is Board Certified in the American Board of Optometry. During college, she was drawn to stories of how the work of artists reflected how they visually perceived the world. She entered the field of Optometry in hope to understand how patients perceive the world and help them maximize their vision. Her passion is in working with patients with vision impairment. Patients of all ages can have vision impairment of any level. Her goals are to help patients learn about their vision and find creative ways to utilize it to their best potential. 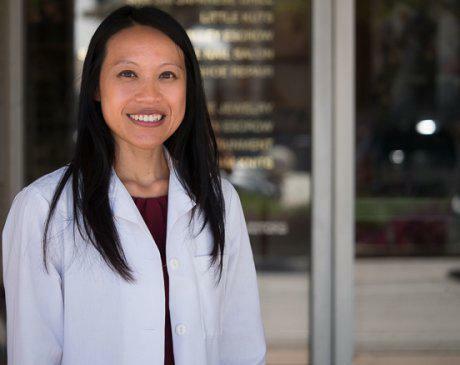 After all these years, Dr. Tran is ecstatic to return home to the San Gabriel Valley to be closer to her family and care for her community. She enjoys art, photography, and exploring new places.